Makeover Monday: How Does Video Game Playing Vary by Demographic? This week’s Makeover Monday has a mix of good and bad parts. It comes to use from Forbes. Let’s review this from top to bottom. The video game font they chose for the title is cute, yet the title itself doesn’t reflect what contained in the entire visualisation. I don’t understand why they chose to use a grey-to-white background. What value does that add? Remember, everything you include in a viz should have a purpose. If not, remove it. I really like the adults vs. teens section. In particular, I like how the bars start on opposite ends and come towards each other. Then we get to the parents vs. non-parents section. Why didn’t they continue the theme from the adults vs. teens section? Instead they chose some weird radial chart type thing that makes comparisons very difficult both between parents and non-parents and across platforms within a single category. Basically, this section is a disaster. The images of people playing videos games on a giant screen is cute, but it doesn’t enhance the viz in my opinion. My makeover of this viz is focused on simplification and making the comparisons easier. For starters, I created a summary at the top to compare all of the demographics. I then used the bar chart idea from the original to break each set of demographics down by the platform. Notice that each of my charts is in the same order by platform. I also tried to incorporate better titles into my sections. Click here to download the Tableau workbook. I think the main concern, if I understood well the data, is that the percentage given are for the gamers population (which is 53% of american adults, and we don't know for teenagers). If this is the case, we cannot conclude about the number of gamers in both categories. We might say though that teenagers are more engaged than adults when it comes to games. The fact that parents vs non-parents don't add up with adults seems a bit confuse for me, especially when presented in the same chart. I love the visual... but I agree with Damien that the data doesn't make sense to me. Shouldn't adults fall into Parent or Non-Parent, and if so why is the average of adults so much higher? In skimming the original research, maybe it is because seniors are skewing the numbers but are potentially excluded from the parent breakout? 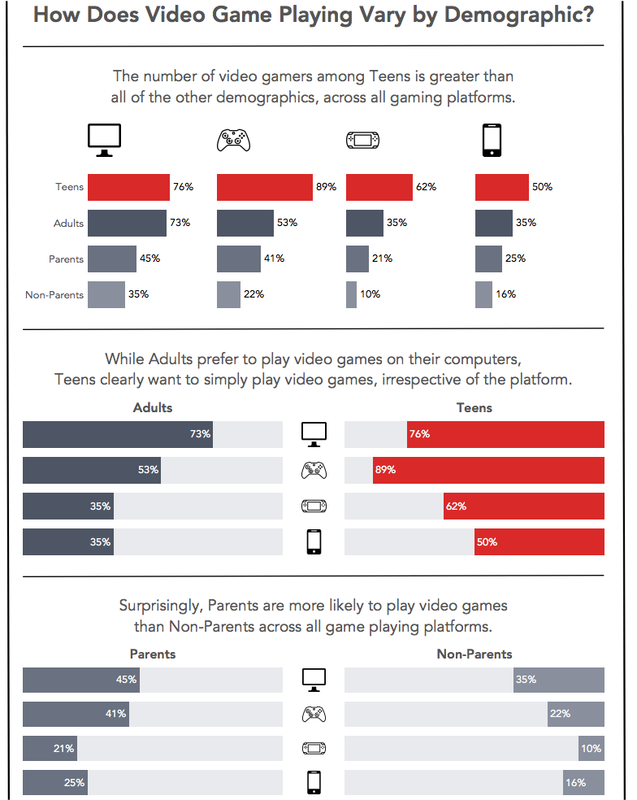 It appears to be that the first set is % of Adult/Teen Gamers, the second set appears to be the % of ALL Adults (Parents vs. Non-Parents) so they aren't consistent metrics. It's pretty clear to me that they slapped that together in a rush - no one spell checked the original. Mobile is mis-spelled. Potential data issues aside—I like how the horizontal bars look (aesthetically), but if we want to allow the audience to also compare adults to teens and parents to non-parents across the various platforms, I'd recommend aligning to a common baseline to make that easier (particularly in the latter case, where the call out text focuses on the differences between the groups).